Warner Debuts Epic Five-Minute+ Trailer for The Wachowski's 'CLOUD ATLAS'! Andy & Lana Wachowski & Tom Tykwer's adaptation of David Mitchell's 2004 novel Cloud Atlas has a new five minute+ trailer viewable online. The movie explores how the actions & consequences of individual lives impact one another throughout the past, the present & the future. Action, mystery & romance weave dramatically through the story as one soul is shaped from a killer into a hero & a single act of kindness ripples across centuries to inspire a revolution in the distant future. The movie is set to premiere at the Toronto International Film Festival in early September & will screens this October 26th. 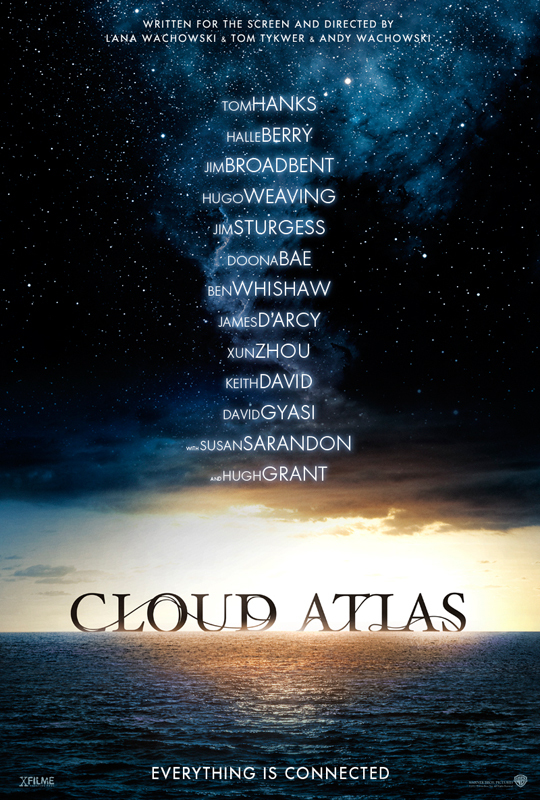 Cloud Atlas stars Tom Hanks, Halle Berry, Jim Broadbent, Hugo Weaving, Jim Sturgess, Doona Bae, Ben Whishaw, James D’Arcy, Xun Zhou, Keith David, David Gyasi, Susan Sarandon & Hugh Grant. Hit the jump for the details plus a director’s commentary video. Synopsis: "A reluctant voyager crossing the Pacific in 1850; a disinherited composer blagging a precarious livelihood in between-the-wars Belgium; a high-minded journalist in Governor Reagan's California; a vanity publisher fleeing his gangland creditors; a genetically modified "dinery server" on death-row; and Zachry, a young Pacific Islander witnessing the nightfall of science and civilisation -- the narrators of Cloud Atlas hear each other's echoes down the corridor of history, and their destinies are changed in ways great and small. In his captivating third novel, David Mitchell erases the boundaries of language, genre and time to offer a meditation on humanity's dangerous will to power, and where it may lead us." I'm reading: Warner Debuts Epic Five-Minute+ Trailer for The Wachowski's 'CLOUD ATLAS'!Tweet this!